Recently, during a hideous Minnesota snow storm when the google maps was colored all red, I decided to just hang out on Grand Avenue for awhile. I say decided like it was a choice. Rather, I was stuck there for awhile until traffic cleared up. Instead of wallowing because I was not able to get home. I decided to frolic on Grand Avenue. Usually, when I stop by Grand it is for a specific purpose. I stop at the store that I need to get something from and I get out of there. Parking can be a mess and I get stressed out about leaving my car. Was that really a parking spot? While I was over there freaking out about parking I completely forgot to explore. I had no idea that I was missing a bunch of other stores that I never knew were there. This storm made me make my own fun. After stopping into a few stores by Grand and Victoria. I stopped into Salut. 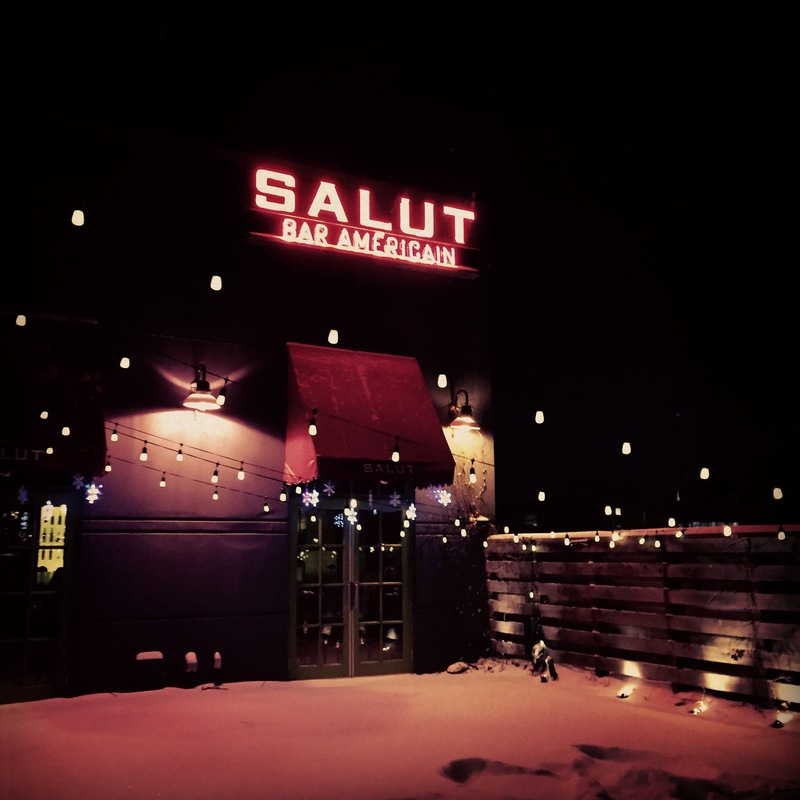 I have been to Salut a few times and already knew I was a fan of their Pomme Frites and french food in general. 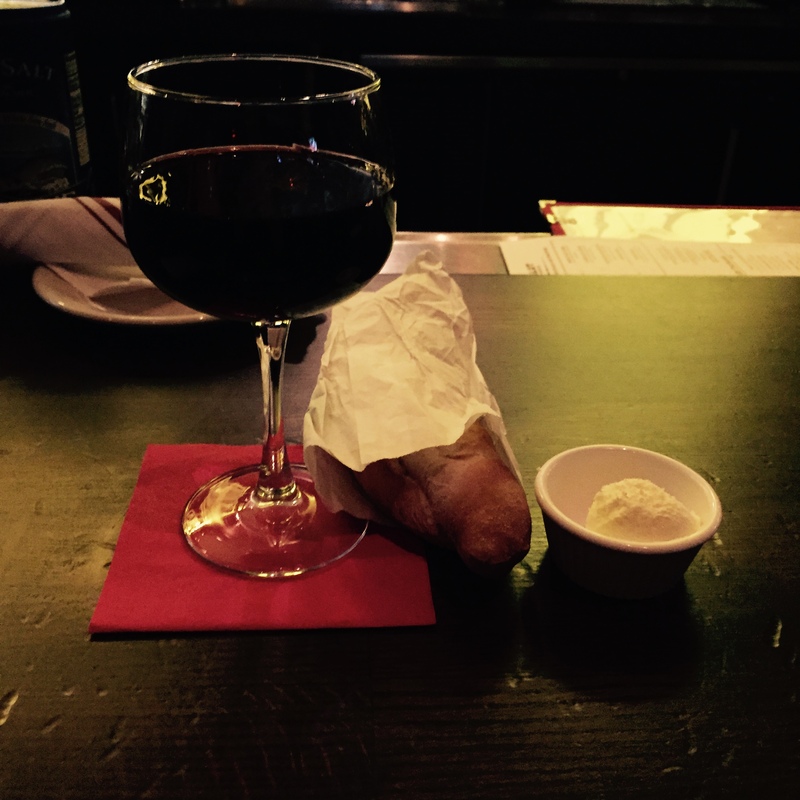 I took a seat in the bar and had red wine and ordered some food off the happy hour menu. I cannot tell you how relaxing it was to sit down and just eat some really good food, alone. Everything I tried was delicious and the staff was more than accommodating by allowing me to hang out in the bar until I could get home safely. Overall, the happy hour menu isn’t dirt cheap prices. But, would you really want to eat food that was that cheap to make anyway? I thought the prices were fair for what you got and I really enjoyed the glass of wine that I had. Because stop in and explore Grand sometime. What is your favorite store on Grand Avenue? I eat a lot of sushi. 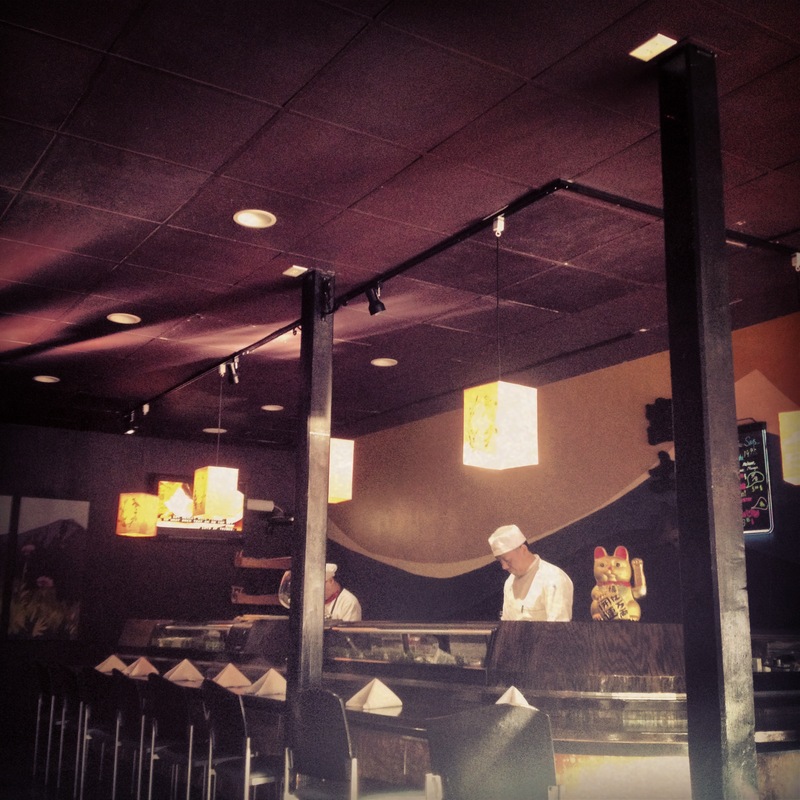 Now, I am finally ready to do a post about one of my favorite places to get sushi in Minneapolis–Kiku Bistro. Kiku Bistro, formally known as Mount Fuji in Uptown is one of my go-to sushi places. I was hesitant to share it until now because this is a place that I go frequently and sometimes I just want a place to myself, but that’s selfish. So, here we go! Kiku is one of my favorites because they have a great menu that allows people like me who love any kind of sushi to get what I want but still has rolls for those people who aren’t avid sushi eaters. They have several rolls that have more flair and are great for the new sushi eater. This includes well prepared deep fried rolls. I like it because I have always had fresh fish. There has never been a time where I have had anything taste a “bad” fishy (you know what I mean). The happy hour is excellent too! With $3 wine and Sapporo and discounted rolls you cannot go wrong. Plus, there is really only one or two hours a night that they don’t have happy hour so you are bound to hit it. The rolls aren’t super cheap. If they were wouldn’t you wonder what kind of fish was in them? Just saying. Lake Calhoun- This has a lot of flair with special sauces and crunch. Not usually my style but it is very good. Great for the first time sushi eater. Avocado roll- It gives you a break from everything else. It is fresh and filling. Spicy California- Good clean taste and is priced right! Vegas- Deep Fried. This has great flavor and is fun. I am picky about deep fried rolls and they get it right. 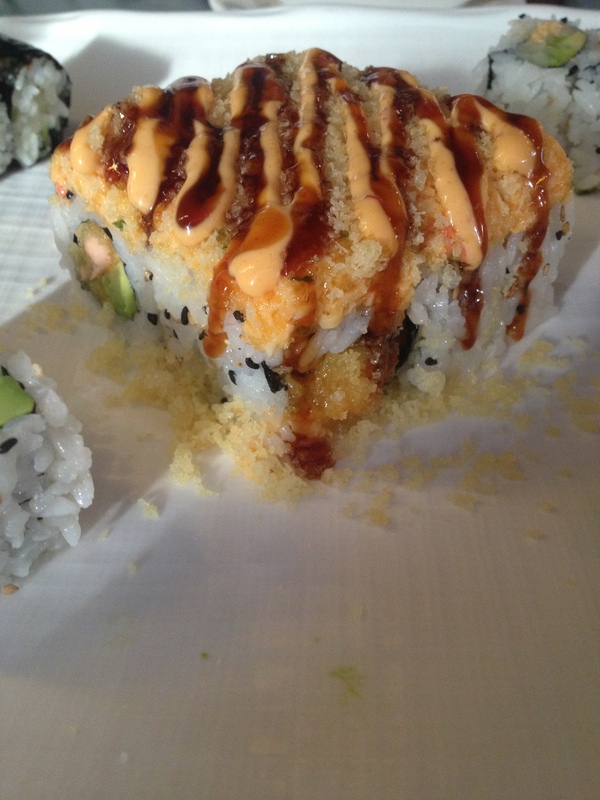 Uptown Roll- If you like fish only this is a great option! Good flavor but you only get 4 pieces. Rainbow Roll- It’s your basic roll with many types of fish. It’s fresh and good! Overall, if you are looking for a new sushi place to try this is a very good option. I love it and I hope you do too! Because fresh fish is good fish. This was quite possibly the worst happy hour food I have had in awhile. 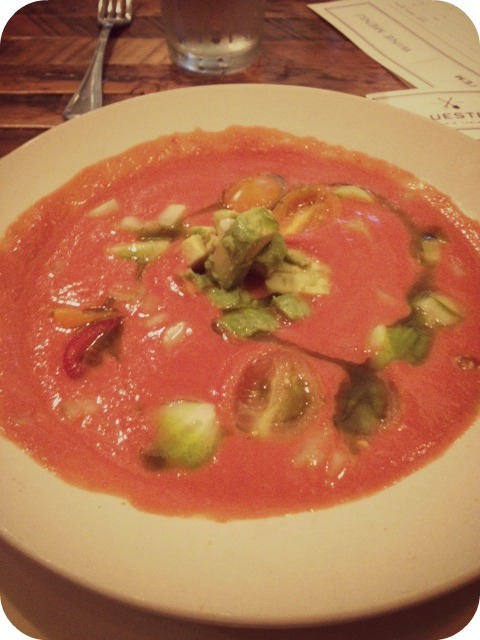 I was wondering why Rojo in the West End was packed while Figlio was mostly empty. This place will not be open for much longer unless the food standards change dramatically. Firstly, let me start out by saying that the space is beautiful. 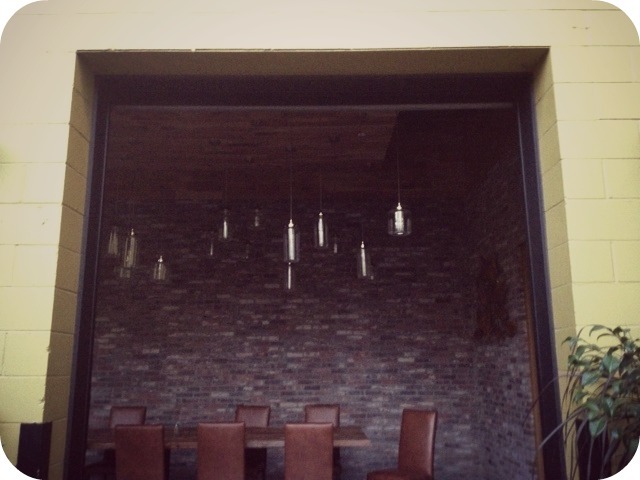 There is a large dining room and a nice bar area. Secondly, the service was great. They went out of their way to make sure that the guests were happy. The only thing missing is good food. 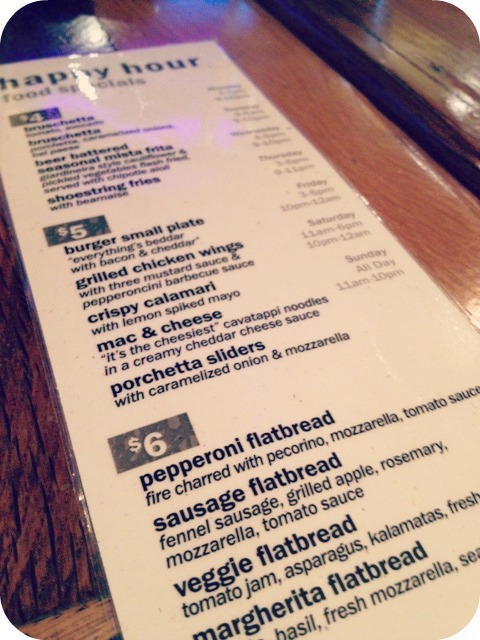 The biggest disappointment of the night was the flatbread. I remember back when Figlio was in Uptown the flat bread and pizzas were all handmade with real dough and then cooked in a brick oven. You know having an open kitchen where you make the flat breads only goes well for you when you actually make the flat bread. Watching the ‘chef’ take out a pre-made hard flatbread out of a plastic package sealed it for me. Not to mention how the toppings were handled. Yuck. 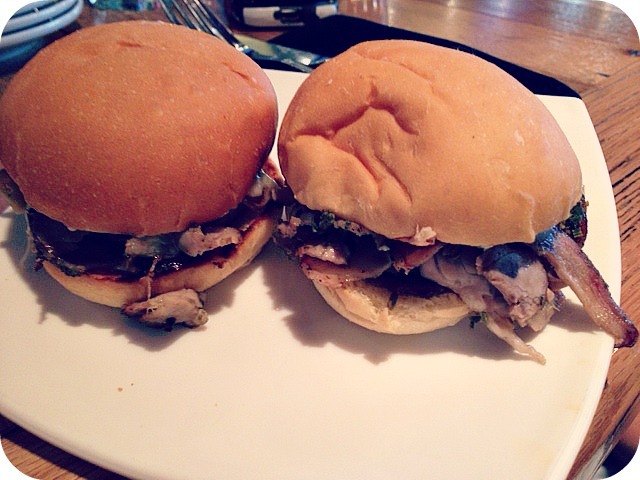 Big mistake ordering the porchetta bruschetta and sliders. Same thing different bread. Both not great flavor wise. The only two things that I liked were the fries and wings. Holy moly, the fries are great. Perfectly cooked and great with the béarnaise sauce. 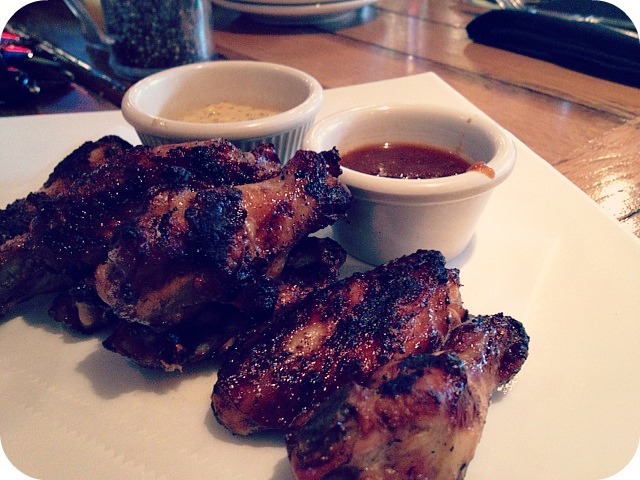 The wings were seasoned very well but I would have liked to have different sauce with it. The mustard and BBQ sauce did not do it for me. 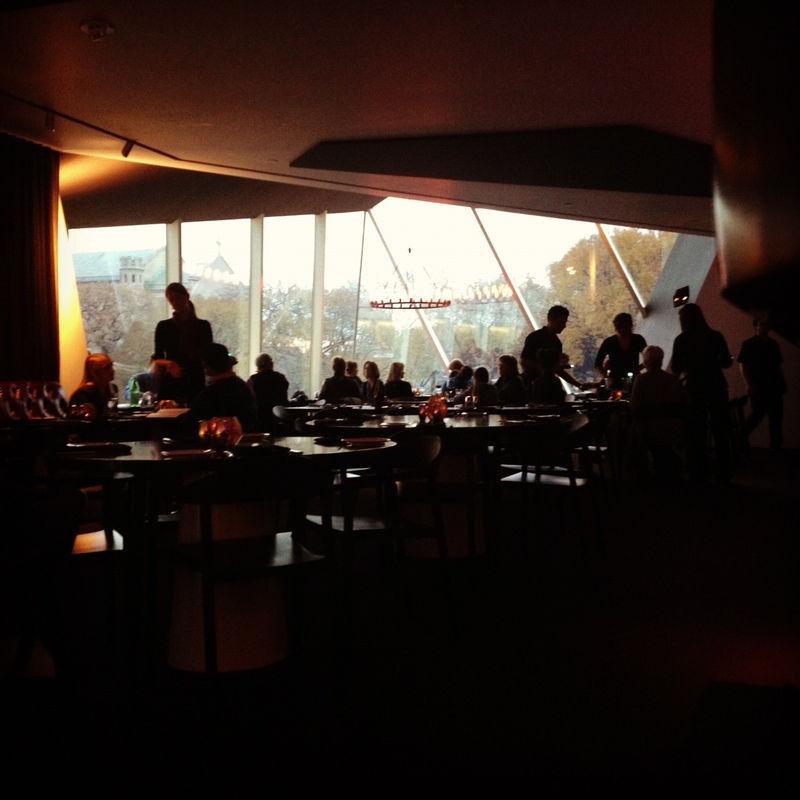 It was weird that I liked those things the best and neither of them were Italian which is most of the menu at Figlio. My suggestions are to make your own dough and make quality flat bread and to take one or both of the Porchetta items off your happy hour menu. Make a new dish. Go back to basics and serve high quality real food even for happy hour. There are so many people like me rooting for Figilo from Uptown to be reborn. This is not quite it. What was your experience here? Should I give it another try? I could not believe it when I read it on the Solera website. All night happy hour on Thursdays and even on their rooftop. What? Is this real? I had to go investigate. They sort of have a happy hour on the rooftop because it includes only drinks, none of the food was happy hour priced and it should have been clearly stated on the website. But, it is worth it to see the view from their rooftop and sip 3 dollar sangria. 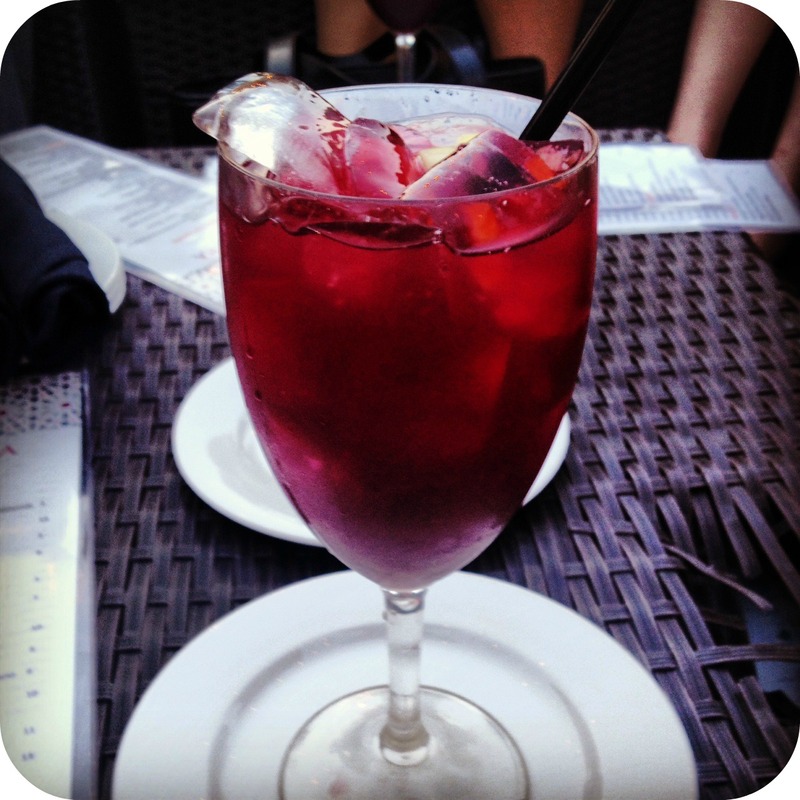 The sangria comes in both white and red and is refreshing on a hot summer day. It pairs well with most of the food and when it is 3 dollars you don’t have to stop at just one. 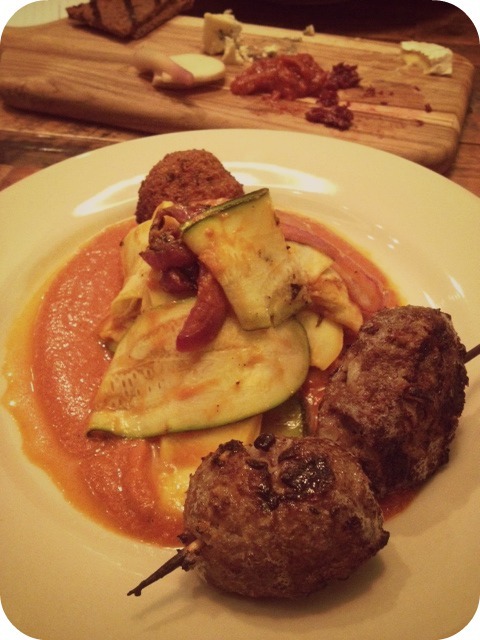 Solera is a tapas restaurant which means that they have small plates that are meant to be shared. I have had most of the menu and I would suggest this restaurant for an adventurous diner. People who are used to the normal burger or steak joint will be thrown off by both the portions and the ingredients. Not that it is bad, it is different. They have rabbit, quail, escargot, and a few other items that you do not see on most menus. While this excites me, it scares some people who are not used to these ingredients. If I am with a person like this, I order for them and then lie to them saying it is steak or something. Well, once they say they really like it, I tell them it is actually lamb. It is sort of like dining with children. I do not advocate doing this to someone who would actually be upset or someone who could inflict pain upon you. But, it is a fun way to surprise and delight a picky diner. 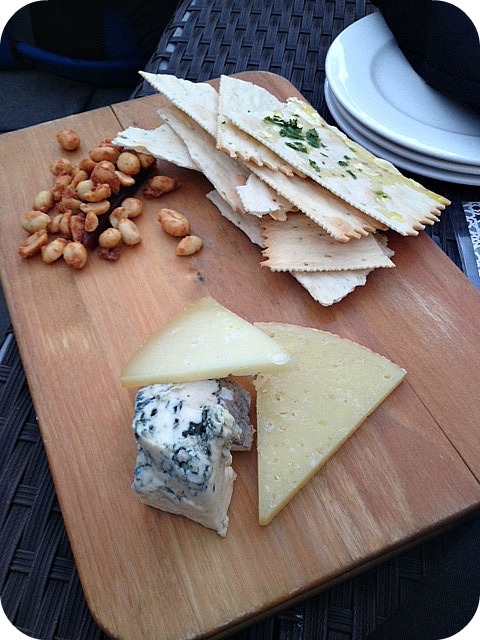 This night I had the cheese plate which had an Iberico cheese on it. It is sort of like a Manchego and made with sheep, cow, and goat’s milk and pairs well with a tempranillo. I had forgotten how much I like Iberico. I was very impressed by my server who knew the menu very well. She explained dishes and offered suggestions. This is very helpful when the menu has some items that people don’t make in their home kitchens often. What is a croquette again? 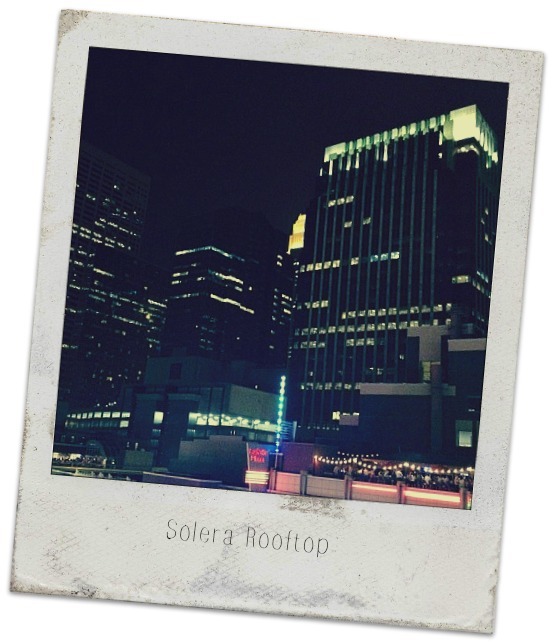 If it is the perfect summer night the rooftop at Solera is a great pick. I can’t think of a time that I have had more fun eating food. Now I completely understand why Travail Kitchen and Amusements is one of the most popular restaurants in the Twin Cities. Although, it is closed right now for a location change, the chefs were on top of their game as guest chefs at Gather. Gather is one of my favorite spots in Minneapolis because of the beautiful location, great happy hour, and the creative food from the guest chefs. The first Thursday in June was particularly exciting since Gather was celebrating it’s second year and because the Travail chefs were there. 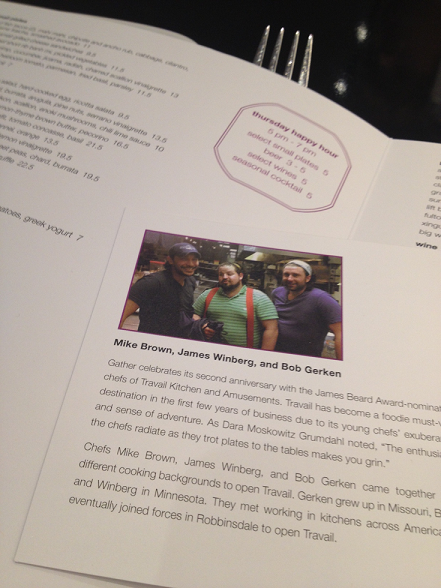 Mike Brown, James Winberg, and Bob Gerken know how to get people excited about food. The mood in the room was electric. I had fun learning about their playful dish and the ingredients in it. 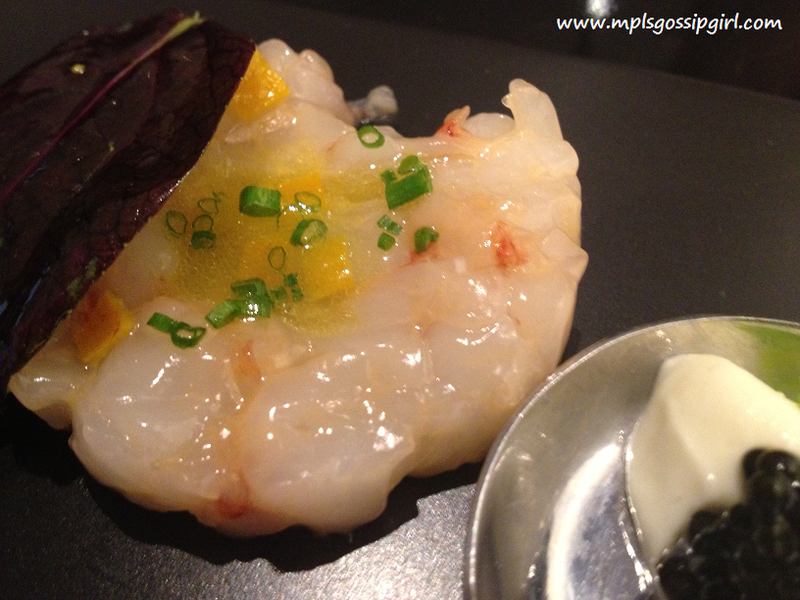 Have you ever had langoustine before? This was a first for me. As you can tell, the Travail chefs do things differently. 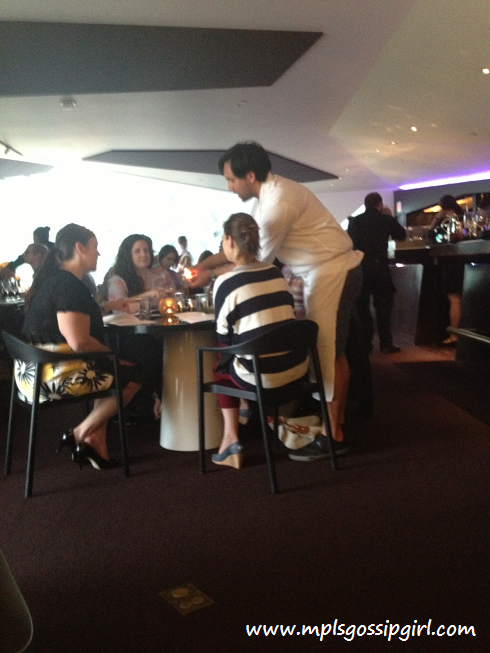 They went around and spoke with each table and showed them how to eat their dish. 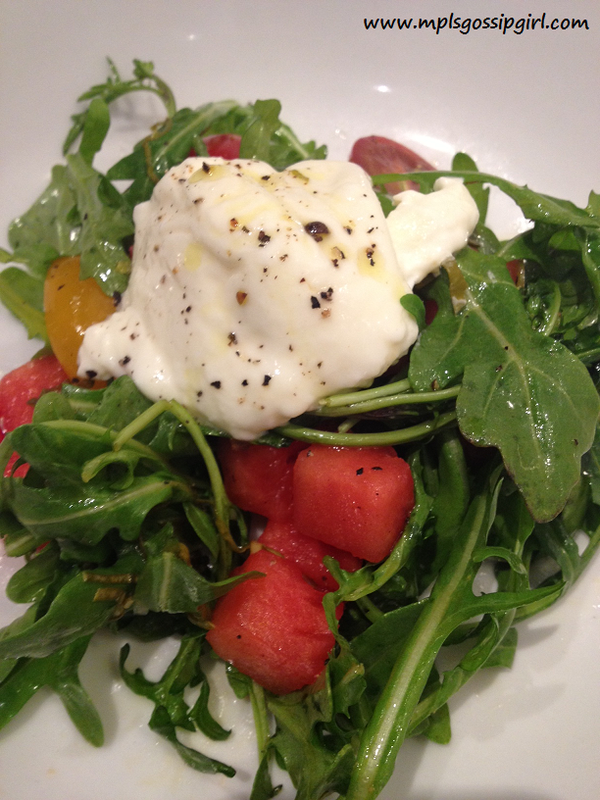 I also had the watermelon salad which is on the summer menu at Gather. It was light, a bit spicy, and very fresh. 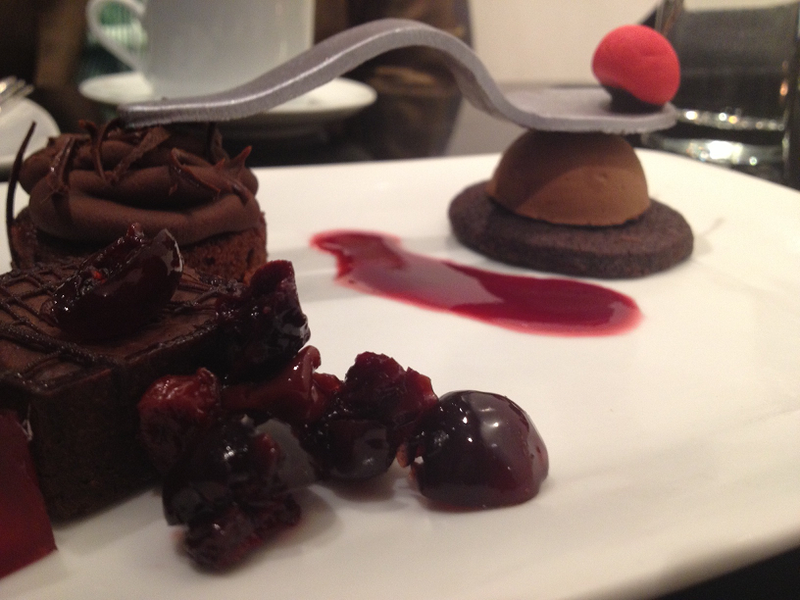 This cherry and spoon dessert is only at the Gather for a limited time. Yes, you can eat the spoon! It was not my favorite dessert and tasted like it came out of a fridge but it was fun to look at. 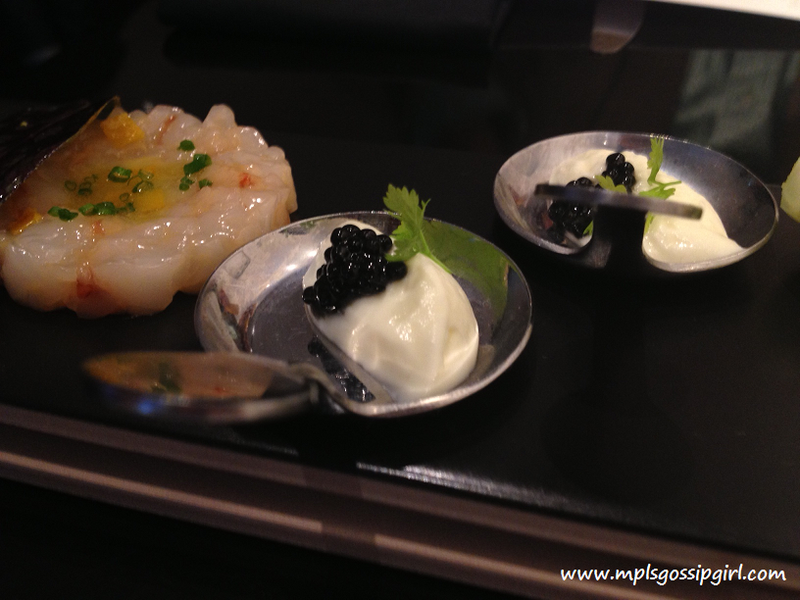 You only have one more Thursday to get the guest chef plate with langoustine (google it…) . What is the most fun you have had at a restaurant in Minneapolis? Where do I need to go? I was very happy to hear that a restaurant would be moving in to the old The Independent space in Calhoun Square. I was a huge fan of the Independent because of the location. It was a bit tucked back in Calhoun Square and you needed to know that it was there to be able to find it. I love Uptown but I really have a hard time enjoying the bar atmosphere of some of the restaurants during weekday meal times. They sometimes can be filled with non-working- inappropriately dressed- I am just here to get really wasted because they have super cheap happy hour specials. Oh yeah and I am going to screech at the top of my lungs every time I see someone I know and invite them over to my over-crowded table filled with empties. And I NEVER tip. You can tell that I have some pent-up frustration with some of the frequent loud day drinkers of Uptown. Not that I didn’t used to be one of them partaking in the happy hour deals when I got off of work early. I did always tip though. 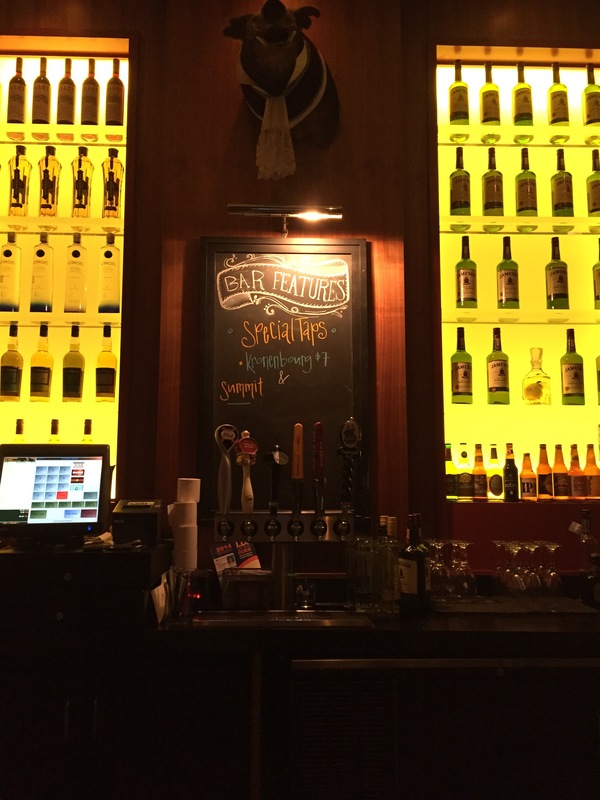 Republic in Uptown is the perfect chill, relaxed, and calm bar destination. I was able to visit during a weeknight and was able to have a conversation with the person next to me, enjoy a drink, and eat some fantastic food. This is not your normal bar menu. If I lived in Uptown. This would be my go-to bar. This bar has an everything menu. It has bar favorites plus items for someone who chooses to eat a bit healthier. The salads are not your typical house salad with ranch either. You have choices of a kale salad with a white balsamic and another with asparagus ham and even manchego cheese. When I visited, I tried the Minnesota Po’Boy sandwich. 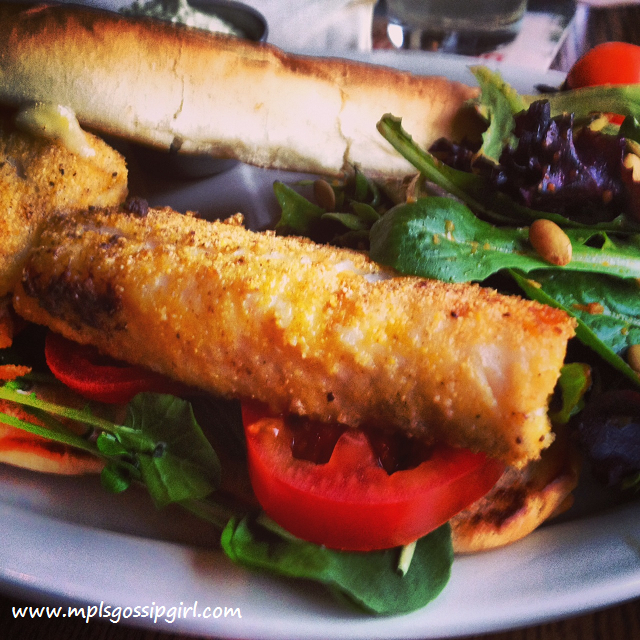 It was a walleye sandwich with a really nice tartar sauce or as they call it a lemon aioli. 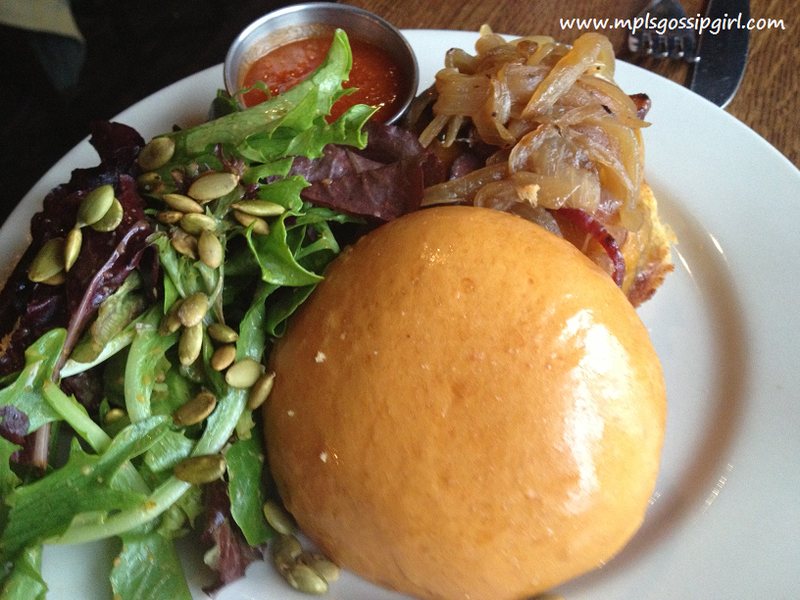 I would also highly recommend the burgers because they are grass-fed beef. It always makes a burger more tasty and delicious. Next time, I will be trying the brie and red wine reduction burger. Yes, I know that sounds fantastic. Save room for dessert. 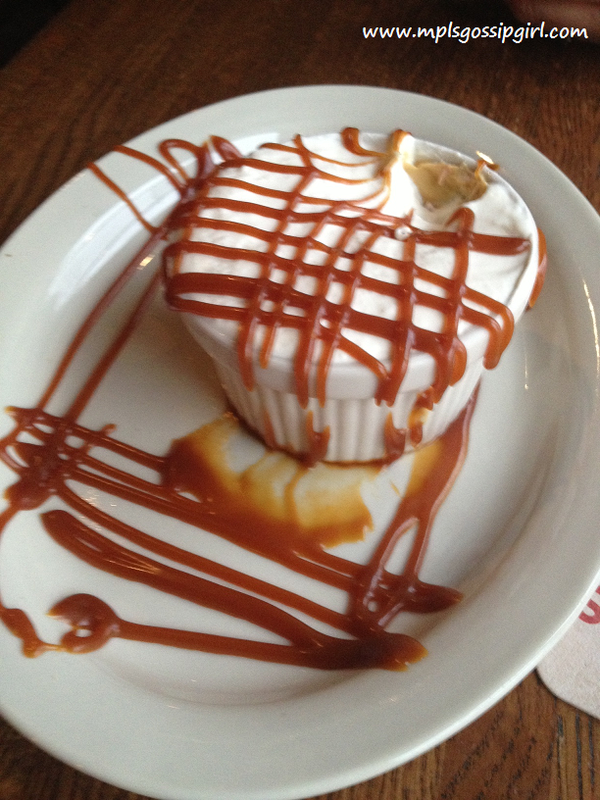 This is a salted caramel pot de creme. Yes, it was as good as it sounded. You should follow them on twitter because they are always changing out their taps and they tell you about them. One of the best beer selections that I have seen in the cities so far. Cocktails are also good, so give them a try as well. Republic also has a Seven Corners location in St. Paul which has a different menu. That should be worth a try also. because this is my new favorite bar. Crave is a great place to bring a group of people who may have many different requirements when having a meal. They have a very large menu with both sushi and american food. So if you have picky eaters in the group they are bound to find something that they like on the menu. This is also the case with the Happy Hour menu. Crave is a great place for a large group during happy hour. The booths are big and it is not limited to just sitting at the bar. We ordered 8 items for four people and it was a little too much we were not able to finish it all. 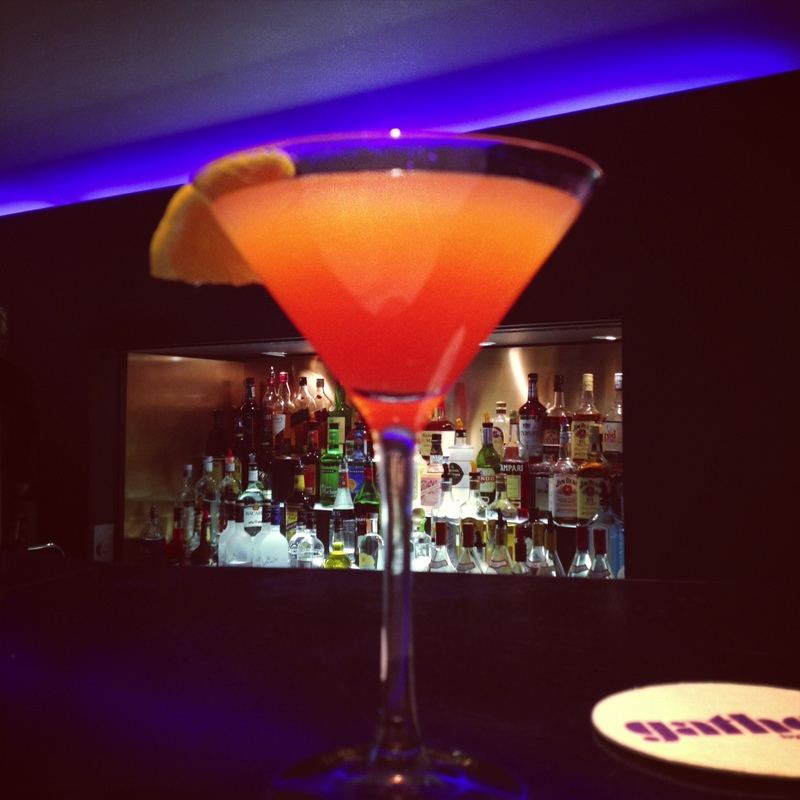 They also have many items on their happy hour menu, that way you can order a variety of different types of food. I liked the mini burgers the best since I was only looking for a little bit of food and then was able to share the other burger with others. They were cooked well and I liked the small shoe string fries that were served with it. Chicken sliders were good but a little bit dry I could have used a sauce to go with them just to add a little bit of moisture. A bit of something on the side would have been great. I needed something a little bit spicy and creamy. I would have done some sort of aioli. I did not like any of the sushi we got off the happy hour menu. I am not a fan of a salad with my sushi mostly because it makes it very hard to eat. When you are eating and socializing it is nice to be able to pop in a piece of sushi. The rolls that we ordered had half of the roll with vegetables sticking out of them. After trying to eat some of them we gave up and left the rest on the plate. I also had a roll that the seaweed wrapping was super dry and broke apart before even eating it. I think that with small improvements I would love to come here for happy hour sushi. Overall, the service was great and the ambiance was nice. I really appreciated that the server came by right before happy hour ended and asked if there was anything else that we wanted before happy hour ended. I will be back simply because this place has a menu that accommodates many different tastes. It a great choice if you may not know what your client normally likes to eat because they have almost everything on the menu here. Their happy hour also allows room for large groups. 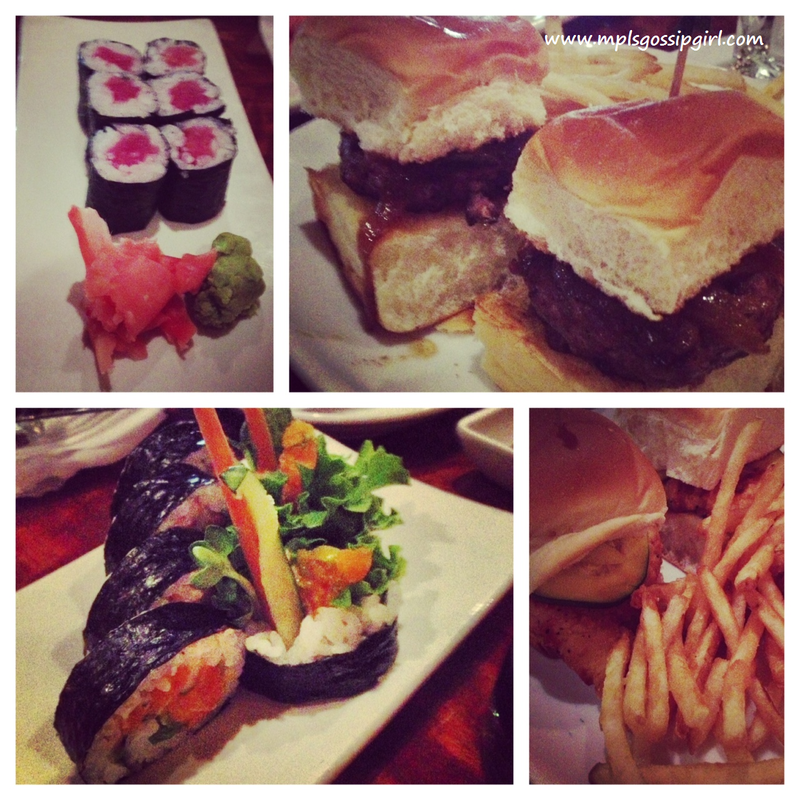 because sometimes you just have to have a burger and some sushi. Looking for a secret spot for happy hour on a Thursday night? Try Gather at The Walker. It is one of the best happy hours in the city that no one knows about. It only happens on Thursday night, when The Walker opens its doors for free Thursday nights. That is right, you do not have to pay to get into The Walker on Thursdays. So, after you eat you can go explore all the wonderful modern art that The Walker has to offer. Why I call this one of the secrets of the city is because when I was there last Thursday only about half of the tables were full. Normally, I equate this to either bad service or overpriced foods. That is not the case with Gather. My best guess is that people think you have to pay to get into the Walker to eat in the restaurant. Not true. Plus, it is a bit hard to find in the building but if you get lost ask one of the Walker staff. 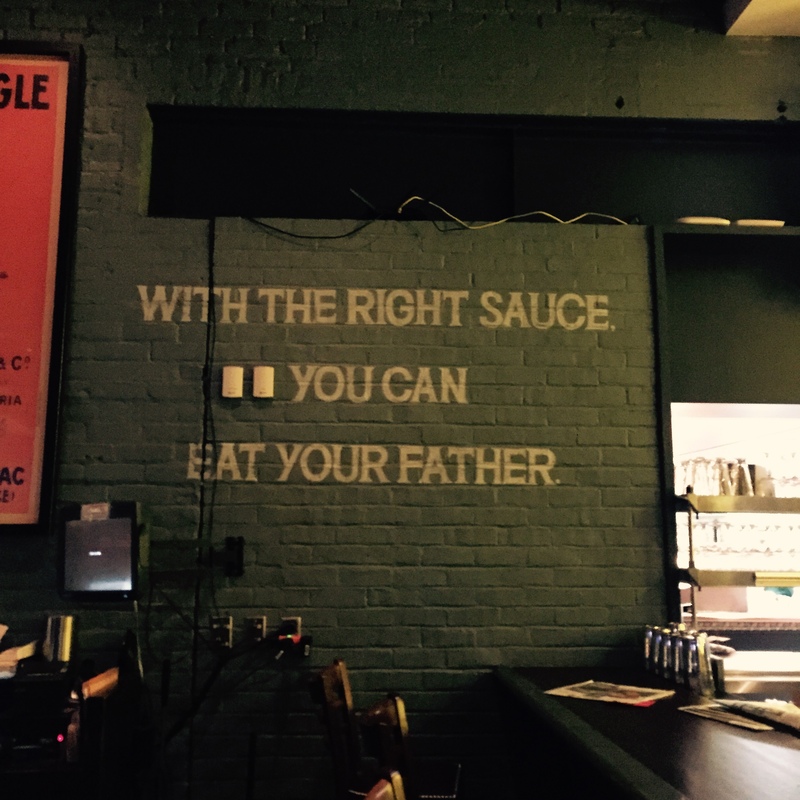 You need to try this place because the service is excellent. The staff is always trying to make this the best experience for their guests. I even overheard a staff member trying to make a childs nonalcoholic drink fancier and extra special. They go the extra mile. Plus, you can tell the staff enjoys working with each other. Another reason this place is wonderful is that you can watch the chefs work. When I looked over at them they were smiling and having a great time. Good food comes from happy chefs. 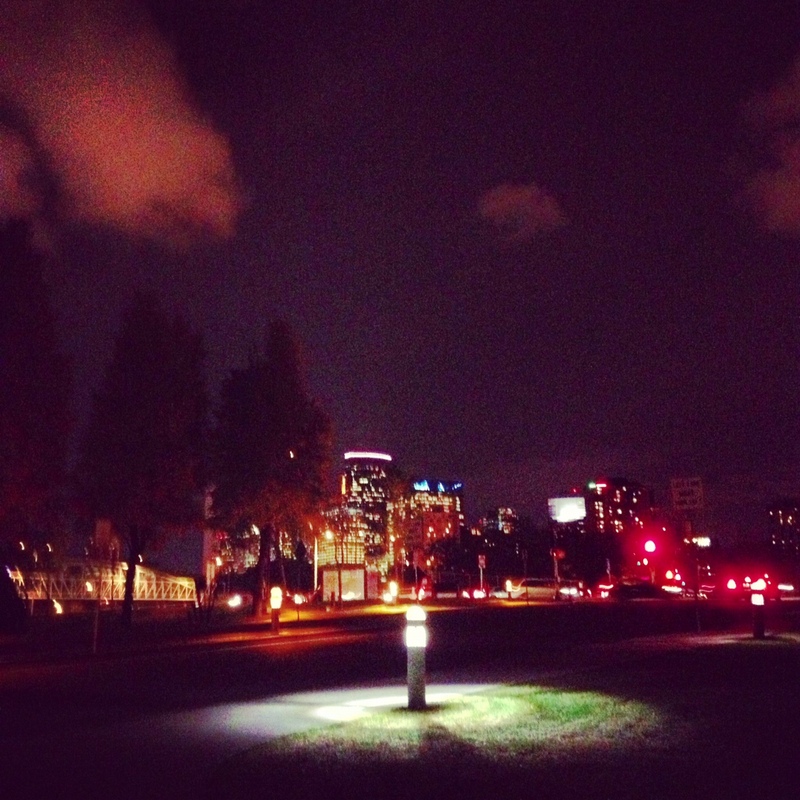 This would be a great place to take a date; the ambiance and low lighting create a romantic atmosphere. This space in the Walker has really nice views. My advice: when making a reservation ask for a spot near the window. It is also a great place for a birthday, they have room for a group of about 8. 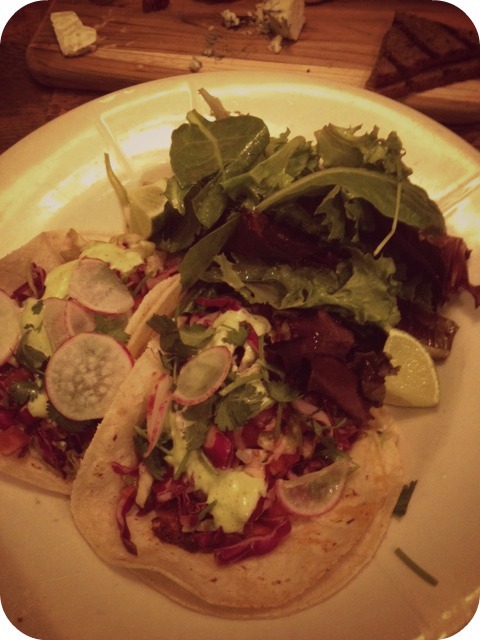 I suggest sharing a bunch of the small plates. 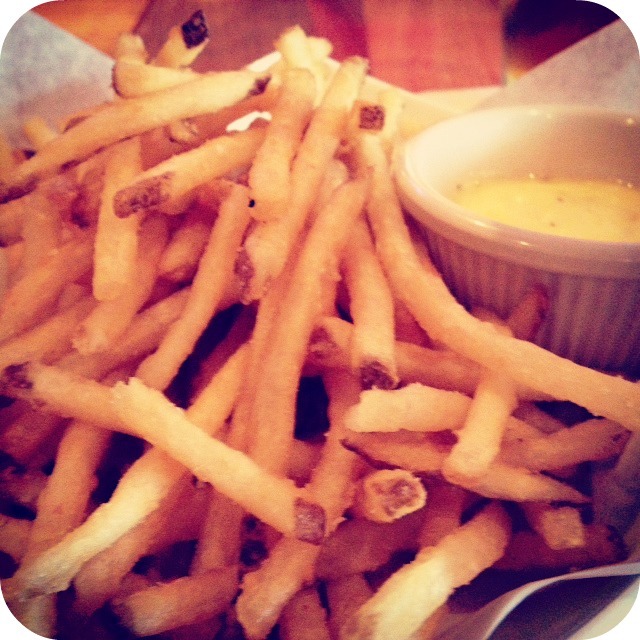 My favorite small plates are the grilled cheese, fish tacos, bahn mi, and the fries with the aioli. Also, each week they usually feature two dishes from a local chef. Those usually are wonderful as well. They are a great way to try something that you might never try otherwise, such as frog legs. Plus, if you go on the first Thursday of the month the dishes from the local chef are free to try. 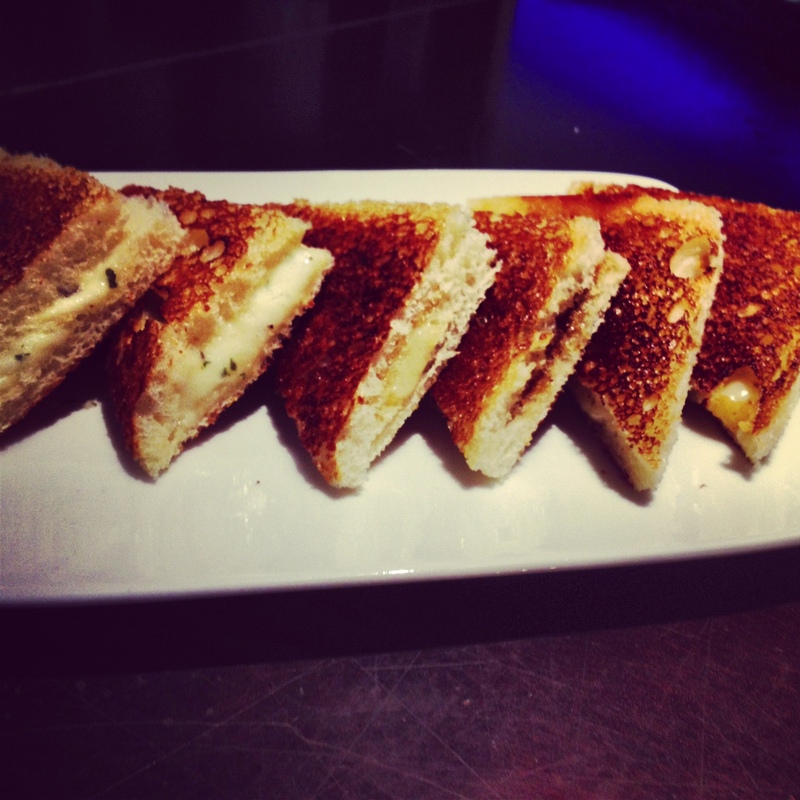 The trio of grilled cheeses differ with what cheeses are served. The ones that I had this week were a cheddar, brie with fig jam, and another one with herbs and mushrooms. All of them were different and fun. 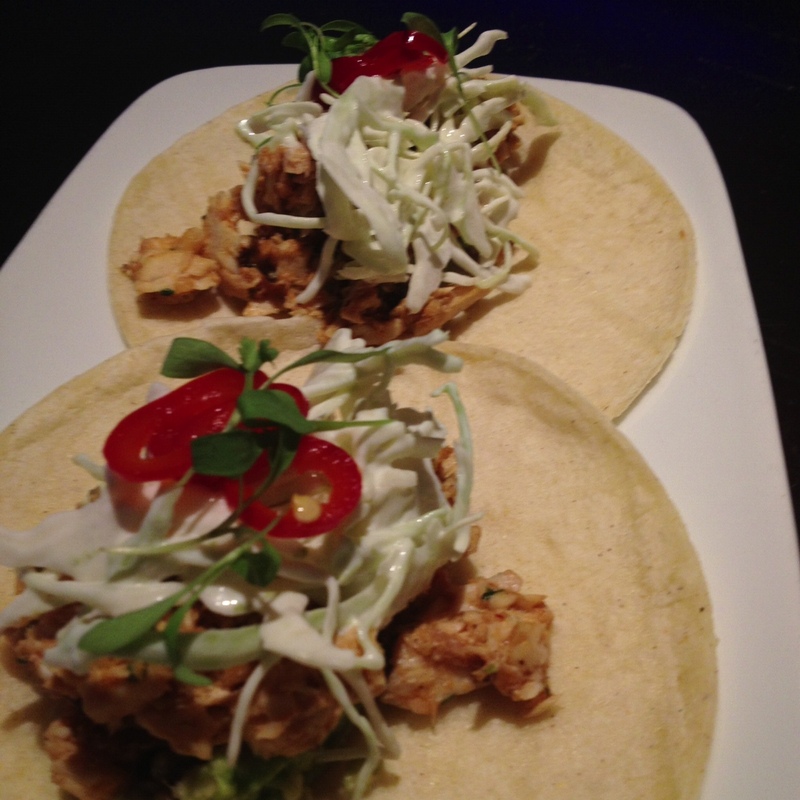 I also had the fish tacos, a little bit spicy but very fresh. I liked the lime flavor of the slaw that tops the fish. All of the food at Gather is locally sourced with much from family farms. Which makes the menu smaller but it only contains dishes that are necessary. Two items on the menu that I want to try next time are the Buttermilk marinated chicken and the beet dish with asparagus, pistachio, and orange. Gather came out with a new menu, so the menu on their website may not be reflective of what is really on the menu now. I am very excited about some of the drinks on the new menu. They are flavors of fall and winter. The Harvest Grog with red wine, cider, whiskey, and maple syrup will warm the heart. Yum! Who comes up with these drinks? I heard a rumor that in December, Gather will be open Thursday, Friday, and Saturday and will be serving British fare to celebrate the British Ad Awards. I also heard a rumor that the next guest chef has a restaurant near The Walker. 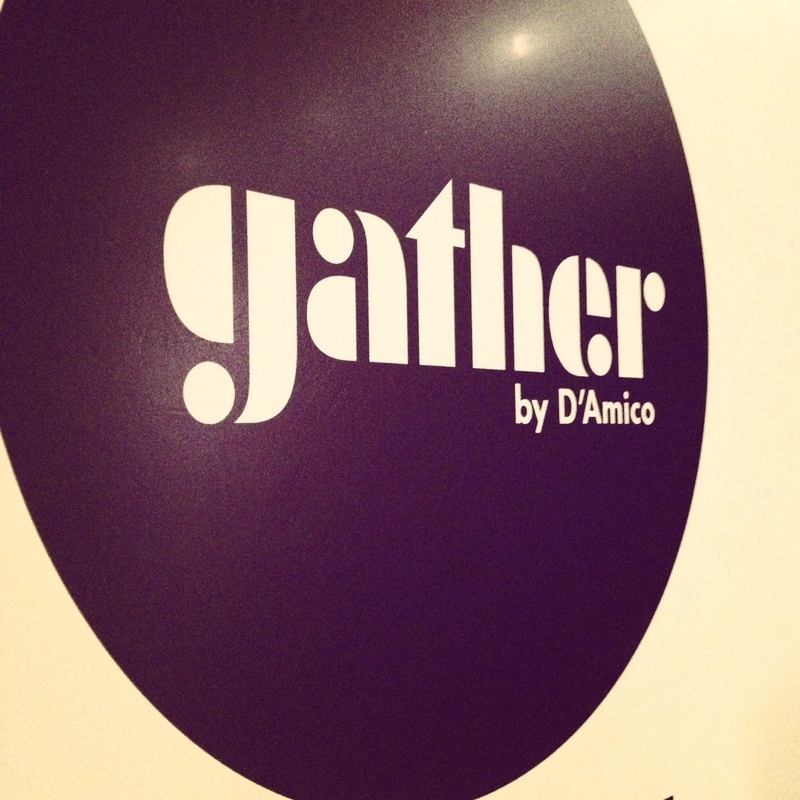 Take a look at Gather’s website HERE. If you have not heard Cowboy Slim’s in Uptown, Minneapolis is closed. I know what you thinking, this is the worst thing that has ever happened to Uptown. Thank goodness they have a downtown location called Cowboy Jacks. Cowboy Slim’s filled the space between Calhoun Square and Drink (which is now Uptown Tavern) and filled a big hole on our hearts. It was one of those places you could go and know you could get a cheap drink from 10-12PM when you were just not ready to go home yet even though you probably should have. I was that place you knew you could always stumble into when you couldn’t quite make it to Cafeteria. It was a place where you knew there would always be a guy who was chatting up the lonely cougars and newly turned 21 year olds. It was one of those magical places that I can’t believe will be gone. Cowboy Slim’s never judged its customers who wore cowboy boots in the city nor looked down on you for your flipped up collar. No, it just wasn’t one of those places. I was somewhere you could go and talk with John who needed advice on a birthday present for his wife when his last gift of a bag of Salvation Army lingerie did not please her. It was a place where even if that guy who chatted you up for 15 minutes didn’t buy you a drink he still found a way to ask you if you had a boyfriend and if you needed someone to walk you home. The men who went there were truly gentlemen, who knew how to please a woman by holding doors, wearing Ed Hardy, and drinking jack and cokes for 2 dollars. Cowboy Slim’s will truly be missed. So, cheers for one final time to them. because I am just not sure how the Minneapolis Bar scene will do with one less cowboy bar.